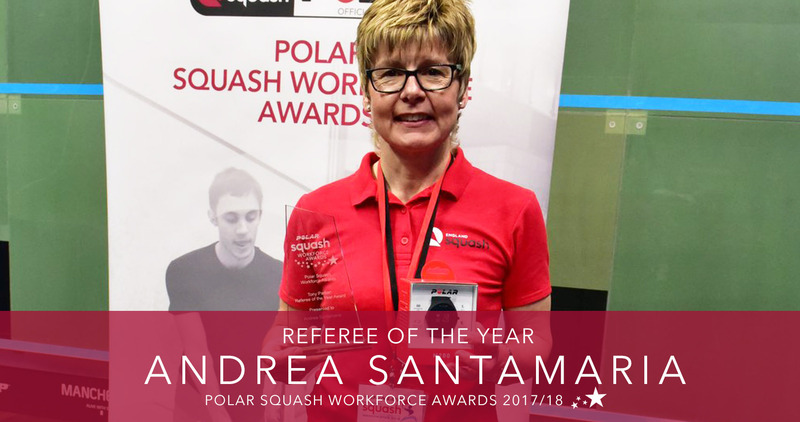 Pontefract’s Andrea Santamaria has been crowned squash referee of the year by England Squash following her commitment to the sport. The Polar Squash Workforce Awards, which were hosted at the 2018 Dunlop National Championships, recognise and celebrate those who have made an outstanding commitment and contribution to the sport. The 49-year-old Barnsley born referee has been cited for the award after making excellent progress this year, earning great respect from both her peer group, referees and players. Andrea has climbed the refereeing ladder and now referees at the highest level, including the British Nationals, Premier Squash League matches, as well as masters, gold and platinum squash events. Having started playing the sport at the age of 18, Andrea became involved in the refereeing element of the game just five years ago. As a player, Andrea has a glittering record in masters squash, lifting the British Women Over 45s National Masters Championship title and the Women's Over 45 European Masters Championship crown in 2017. “I was shocked to be honest, but it is nice. I am not sure if I am worthy of it. It came as a pleasant surprise." “Refereeing is a thankless task, it is tough, and it is hard. There are not many women on the scene, so I wanted to give it a try and see how it goes. “There aren’t a massive number of women on the squash scene at the moment, with the exception of the women’s professional side, and at club level there are a lot of men that play. Through her many years playing the sport, Andrea believes her experience as a player gives her an extra edge, although she hasn’t lost her competitive side to her game. “As a player it probably gives you a different take on refereeing, I think it helps because you know what it is like being on court. I enjoy playing, so I still play whenever I can. “I am always competitive. I think the day that you aren’t competitive and don’t want to win, then you may as well not bother! Despite being a relatively new addition to the refereeing community, her extensive playing experience and vast knowledge of the game has earnt her respect from all corners of the sport.